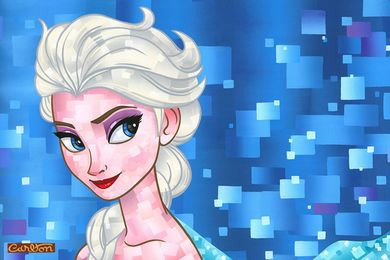 Home | Disney and Animation Art | Disney Feature Films | Frozen | Trevor Carlton Hand-Embellished on Hand-Textured Gallery Wrap Canvas:"Ice Queen" OFFICIAL | Gallery Direct Art | 800-733-1144 Free Ship. No Tax. Trevor Carlton Hand-Embellished on Hand-Textured Gallery Wrap Canvas:"Ice Queen"
Edition: Edition of 195 with COA. Medium: Hand-Embellished Giclée on Canvas - Ready to hang Gallery Wrap - No framing required. About the Artist: Monte Trevor Carlton was born in 1972 in Olympia, Washington State. Although he took up painting in high school, the first artistic passion that Trevor embraced was acting. He decided to forgo an art scholarship in favor of attending a dramatic arts scholarship at Skagit Valley College. Trevor next attended the Lee Strasberg Acting Workshop. The following year he relocated to Los Angeles to pursue an acting career. Amidst the chaos of auditions and callbacks, Trevor paid the bills by working in a custom furniture store, specializing in antiquing and faux finish designs. It was here that a style was born. Using reclaimed lumber as his ""canvas"", he started painting images of vintage Americana with subjects ranging from pop icon celebrity to the hey day of jazz. After numerous gallery shows in Los Angeles and private commissions he has now combined his unique style to that most American of symbols, MICKEY MOUSE. Along with a series of classic lobby card paintings, he has also created a performance piece that has him painting a large canvas of our favorite Disney characters in a matter of minutes. Home | Fine Art Prints & Limited Editions | Collectors Editions | Disney Fine Art | Trevor Carlton | Trevor Carlton Hand-Embellished on Hand-Textured Gallery Wrap Canvas:"Ice Queen" OFFICIAL | Gallery Direct Art | 800-733-1144 Free Ship. No Tax. Home | Disney and Animation Art | Disney Fine Art | Trevor Carlton | Trevor Carlton Hand-Embellished on Hand-Textured Gallery Wrap Canvas:"Ice Queen" OFFICIAL | Gallery Direct Art | 800-733-1144 Free Ship. No Tax.